Time for the best ham bone bean soup! This is how I came to make a huge crock of delicious ham and bean soup. Allow me to set the Thanksgiving Day scene. I was cooking in someone else’s kitchen. While this spectacular kitchen came fully equipped (down to a huge turkey serving platter), the only thing lacking was a double oven because both turkey and ham were on our Thanksgiving menu. Note to self: a double oven is a must in the kitchen of my dreams. Love soup? Check out all our soup recipes! Along with the turkey, an eleven pound spiral sliced smoked ham took center stage with the bird on the Thanksgiving buffet table. It definitely is not your traditional presentation but very little of the ham was left by the end of the meal. It even made for breakfast nibbling the next morning. It was a Smithfield® “holiday ham”. Three distinct flavors were available at the supermarket: Caramel Apple© (no, not, and never), Pecan Praline© (maybe but the ham would have to take center stage) and Hickory Smoked© (a winner for sure). I was not about to tempt fate by serving up anything but the kind of ham I knew would pass the taste test. I opted for hickory smoked with an ulterior motive – soup. However, when it came time to roast two twelve pound turkeys and a sizable ham in the same oven…something had to give. The pig was good enough to oblige and made its way into the slow cooker sitting on the counter – waiting for just this opportunity. Good thing I brought along a large slow cooker right? The ham spent the afternoon cooking sauna style in its own juices. I did add 2 large onions, sage and thyme but this little piggy took care of itself while we focused on the turkeys. 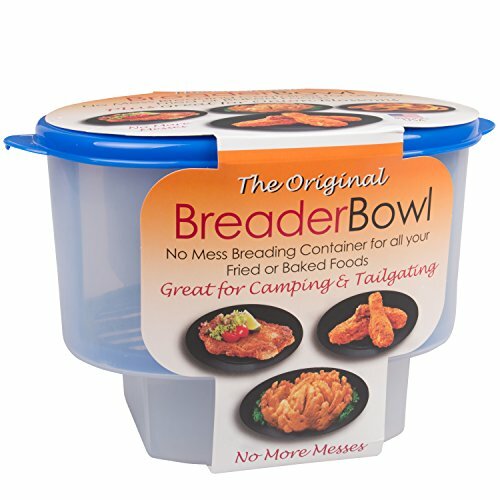 Can’t find soup bones in your local market? Order them! Serve up a steaming bowl of ham soup with vegetables and Great Northern beans. Add a grilled cheese sandwich for a complete meal. Place the ham pieces and bones in the bottom of the slow cooker. Spread the chopped celery, onions, and carrots evenly over them ham. Top with half of the shredded cabbage then the thyme and sage. Pour hot chicken broth over the vegetables. I heated the chicken broth (or the hot water with ham base) so I could reduce the cooking time to 4 HOURS on HIGH. Close to the end of the cooking time, add the rest of the cabbage and the beans. If you use the broth at room temperature, you may want to increase the total cooking time to 5 or 6 hours – just keep an eye on the crock pot beyond 5 hours of total cooking time. To double the recipe, will need a 7-quart slow cooker. 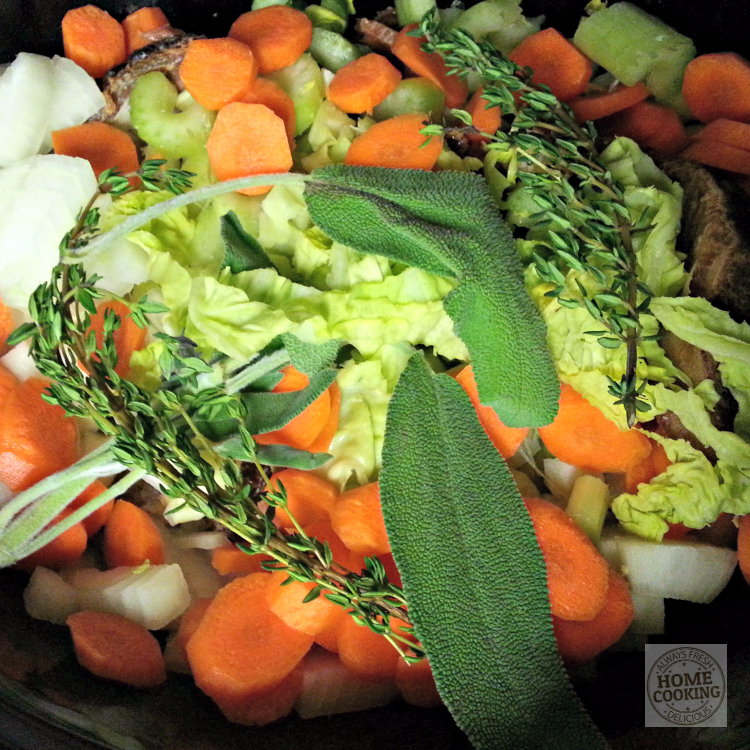 Add a ham slice (unless you have lost of ham left over) to the slow cooker along with twice as many vegetables. Add another 4 cups of broth. Cook on HIGH for 5 to 5 1/2 hours. Following is the perfect recipe to prepare the day after Thanksgiving. 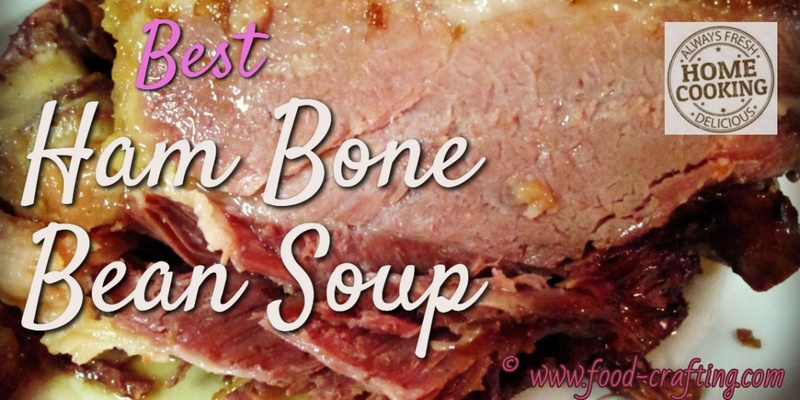 The ham bone bean soup is made with the leftover pieces of meat- and the bone. The same ingredients left over from preparing the traditional turkey stuffing – onions, celery and fresh poultry blend herbs are used to flavor the soup. Next Saturday morning make a big pot of the best ham bone bean soup. 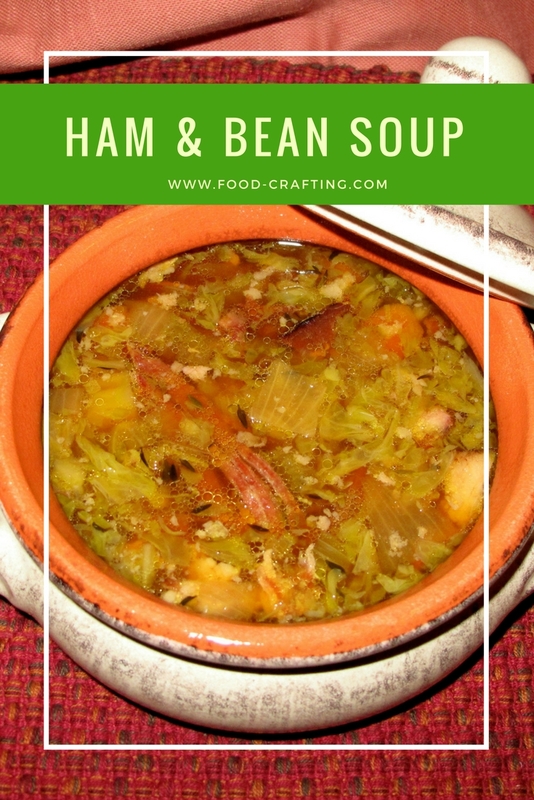 Make this ham and bean soup with nothing more than smoked ham shanks found in the supermarket case. You do not need a whole ham or even a smoked spiral ham. The recipe can easily feeds a small army. We are usually 14 or more seated at the table. Buy a pound of smoked, whole or sliced ham shanks and you will get the same flavor. Regular soup vegetables – carrots, celery, onions and fresh herbs – are all you really need and for variety, instead of beans, chop up a small head of savoy cabbage to add at the last minute. Cut into shreds, the cabbage will cook quickly! My easy ham bone soup serves 8 hungry family members. Need to feed ten, twelve or more as I usually do? It is easy to double the recipe. Remember, this is a set it and forget type meal. Serve piping hot corn bread muffins and a salad. Instead of chicken broth, use ham base for the bouillon. The result is an even more intense flavor for the best ham bone bean soup! P.S. : Don’t wait until the day after Thanksgiving to make the soup. The very same menu is perfect for any Fall or winter day!